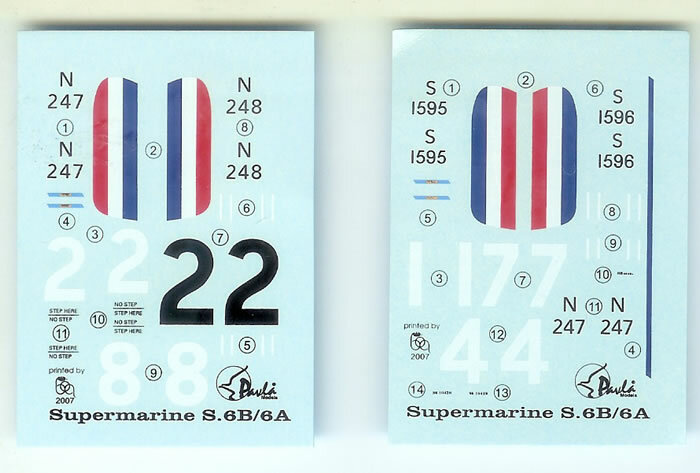 Both 72066 & 72060 (S.6 & S.6B/S.6A) – Good and comparatively simple kits of worthy Schneider Trophy subjects. 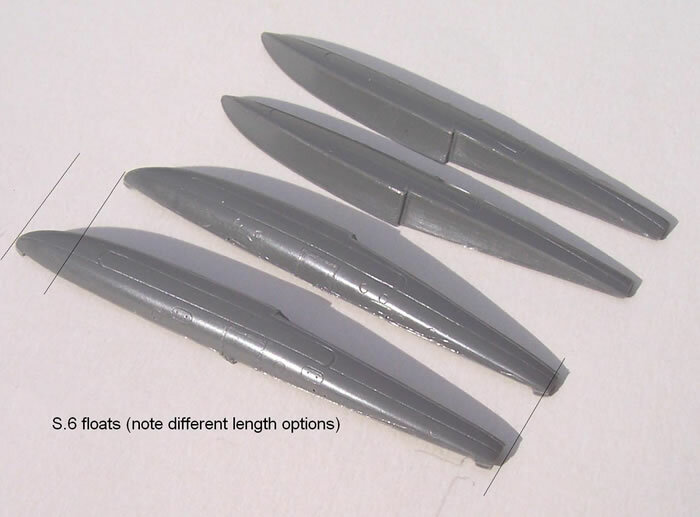 72066 (S.6) - The float legs are S.6B pattern, but fortunately can be smoothed down to suit the S.6. 72066 (S.6) - A good kit that should result in a very nice model. The all-resin format is surprising given the masters are shared with Pavla’s multi-media but mainly styrene S.6B/S.6A. 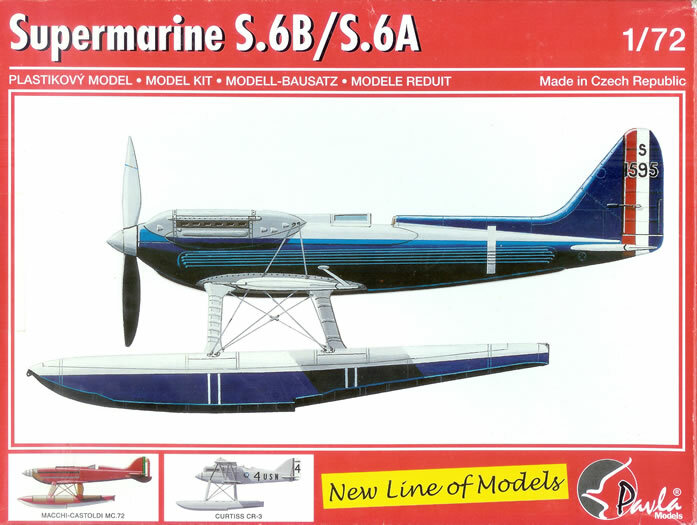 72060 (S.6B/S.6A) - A good kit that should result in a very nice model. Please forgive this lengthy introduction. After reading Profile Publications’ “The Supermarine S.4-S.6B”, I learned a few things that may be of interest to others concerning the “S” for Schneider monoplanes. I have drawn on this reference heavily for what follows. Seaplanes were inferior in performance to landplanes when the Schneider Trophy competition was formulated in 1912. (It occurred to me that this probably meant they could barely fly given the limitations of most planes at that time!). It was an international competition intended to foster the development of aircraft that could use the sea as an aerodrome. The first Schneider Trophy race was held in 1913. Under the trophy rules a nation with three consecutive contest wins would keep the trophy permanently. As it happens, a Supermarine design by R.J. Mitchel, the Sea Lion II flying boat, just prevented the Italians from achieving their third consecutive win in 1922. The S.6’s lineage stemmed from the beautiful S.4 of 1925. This had unbraced and fully cantilevered mid-mounted wings, and was a truly elegant and streamlined machine. This all-wood aircraft that unfortunately suffered a series of misfortunes attributable to bad luck, bad weather and under-development. The S.5 was a far more developed design drawing on the experience of the S.4, but also introducing some new features. 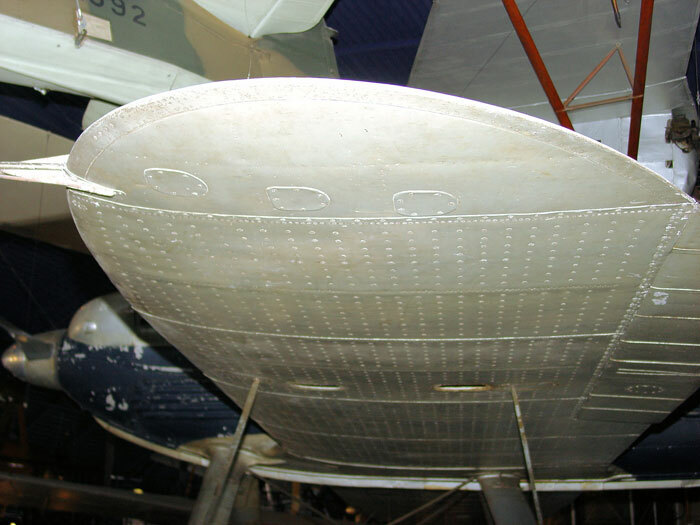 These included an all-metal fuselage with wooden wings using copper radiators as part of the wing surface. The now low-mounted wings had streamlined bracing wires running from the fuselage through the wings to the floats. A more powerful Napier Lion engine and improved propeller were also fitted. Tinned steel radiators running along the fuselage sides cooled the engine oil. The tailplane was made of wood. With all of the coolant and oil plumbing there was only one place left for fuel, so a tank was installed in the starboard float. This additional weight helped counter engine torque when running on the water. A longer starboard float was also tried for to achieve the same effect, but was dropped. However the starboard float was offset 8 inches further out from the centre-line than the port one. S.5’s placed first and second in the 1927 race. The S.6 was a logical development of the S.5 in many respects. The adoption of the much larger and more powerful Rolls Royce R engine had much to do with its successes, as did fuel developments. The R engine was developed from the RR Buzzard V-12. This engine ultimately led to the development of the RR Griffon fitted to later versions of the Spitfire as well as other types. The S.6 had all-metal wings with flush duralumin radiators. The thirstier R engine required fuel to be carried in both floats, and these also had flush radiators on their top forward surfaces to cope with additional engine heat from the R engine. Oil cooling needs also increased, requiring the entire fuselage sides for cooling, and even the fin as part of the return plumbing. Suffice to say the S.6 won the 1929 race, and later set a world airspeed record of 357.7 mph. The S.6 was further refined as the S.6A and ultimately as the S.6B. Changes included increased power from the R engine, bigger floats with flush radiators covering the entire float surfaces down to the chines, plus more fuel in the starboard float to counter torque. Control surface mass-balances were added to fix some flutter problems. That these improvements were made and the race run, was in no small part thanks to Lady Houston, who offered to fund the 1931 challenge when the British government declined due to the impact of the depression. The involvement of the RAF’s High Speed Flight in the Schneider Trophy successes must not be overlooked either. The S.6B has gone down in history as the plane that won the Schneider Cup for a third time consecutively, and therefore permanently for Gt Britain in 1931. However the win seems a little less glorious than it was portrayed at the time, given that no other country raced against the British in 1931. Italy and the USA had both asked Gt Britain to agree to a time extension in order to complete their designs. But they were declined, and so did not enter. Some might say so much for British sportsmanship, but under the circumstances who can blame them? Of course the S.6B is doubly famous because it is often mentioned as the plane that inspired R.J. Mitchel to conceive of the Spitfire. I think that the link between the S6B and the Spitfire has been overstated, as it is purely a conceptual and somewhat tenuous one. To my mind the most remarkable thing about the S.6B was setting a world speed record of 407.5 mph using a special sprint version of the R engine. Quite something for a floatplane only 13 years after the end of the Great War! I’m unsure if Frog-Penguin ever issued a kit in the 1930’s of the S.6B, so probably the first 1/72 plastic kit was by Airfix in 1957. 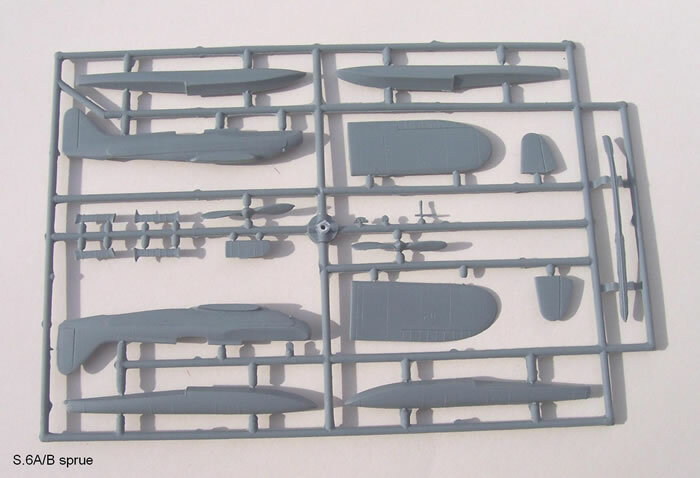 This was a simple kit with a pilot’s head moulded as part of the fuselage halves. Frog produced a superior effort in the 1960’s. Novo, and more recently Eastern Express, have both reissued this kit. There may be other re-boxings, as some Frog kits have been offered by companies like Maquette as well. The most recent release from around 2008 is the S.6B/S.6A by Pavla. 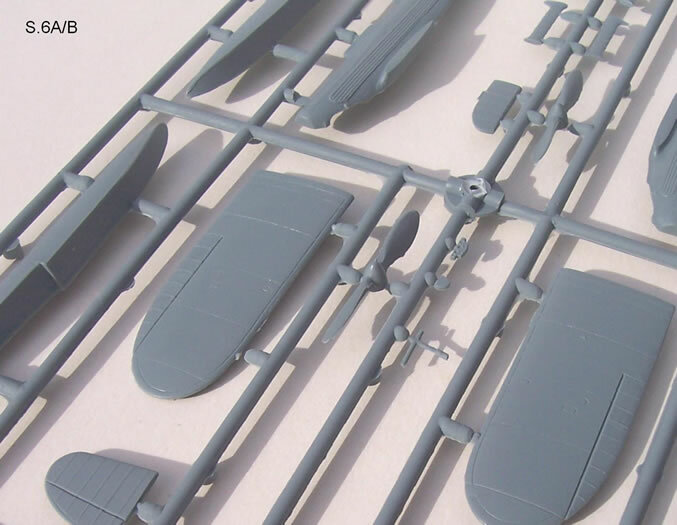 This is a limited run multi-media effort with a fair amount of resin pieces to compliment the styrene airframe parts. I already own this kit, and felt it would be helpful to include it in this review, although the review will focus more on the S.6 kit as a new release. From here I will refer to the S.6B/S.6A kit as just the S.6B for the sake of brevity. The S.6 kit comes in a sturdy top-opening box. This is a definite improvement over Pavla’s previous slightly flimsy end-opening type used on all previous releases including the S.6B kit. A nice colour profile of the subject serves as box art in both cases. As is the modern trend, the box is grossly oversize for the S.6 contents at least, having sufficient volume for four of these kits. I assume that much of Pavla’s sales volume is exported, and then no doubt re-exported in many instances by mail order houses. Surely the box size must impact the end-user’s cost more than is necessary. Perhaps one box that fits all, plus a larger on-shelf presence, outweighs my assumed benefits of smaller packaging. Instructions and colourful painting & decaling guides are a recent Pavla hallmark, but in the case of both the S.6 and S.6B these are simply black & white. I think this may be because lower volumes of these subjects are anticipated. The instructions are clear, concise and have well-drawn diagrams, with brief comments in English and Czech where needed. Colour call-outs are generic, but include Humbrol and Agama paint codes. 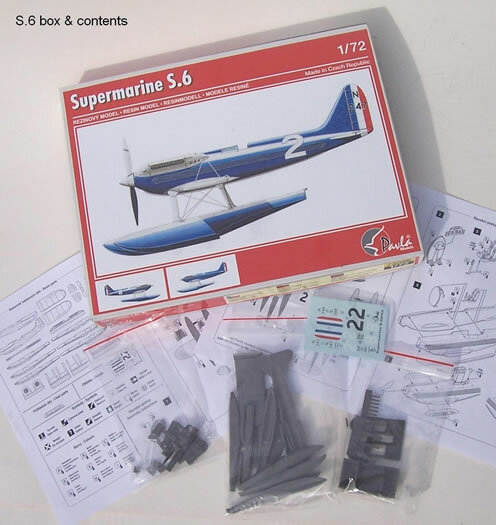 Interestingly the S.6 is an all resin kit, and the first I’m aware of from Pavla for an aircraft. I have many of their limited run injected multi-media kits, and the S.6B is typical of these. As with most reviews, the images really tell the story when it comes to the parts and their breakdown, but I shall touch on a few issues to expand on the information they convey. Pavla has in my view tended to make a bit better job of their resin parts than they do of their plastic. Their styrene kits do demand some refining of fit and cleaning up etc. 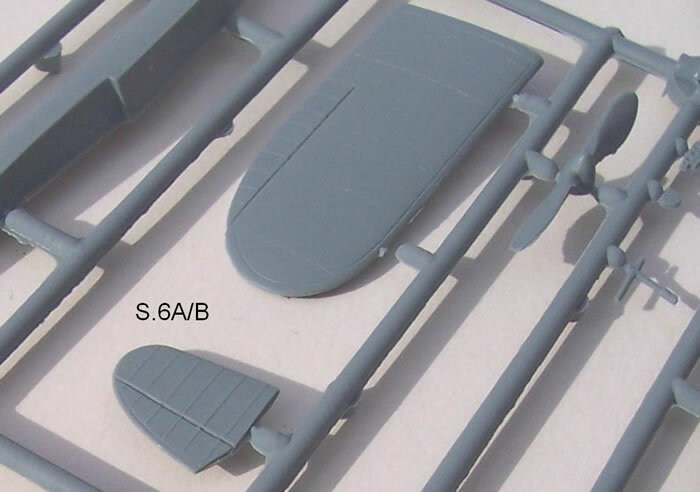 So perhaps it comes as no surprise that the S.6 resin parts appear to more cleanly and a little better produced than the corresponding styrene parts for the S.6B. However this may be in part because Pavla’s styrene always looks matt in finish, which is a little unflattering in appearance. Suffice to say that the resin parts are all nicely cast, and I think the all-resin S.6 may be slightly easier to build. There won’t be a lot in it however, as both kits will demand care when aligning floats and flying surfaces. A larger and subtly different shaped propeller. Smaller floats, including the option of a longer starboard float that apparently was flown on some occasions. This option would give a rather interesting asymmetric appearance, with one float protruding ahead of the other (see image of instructions illustrating this). There are three rearward facing vents on both of the underside S.6 wingtips. 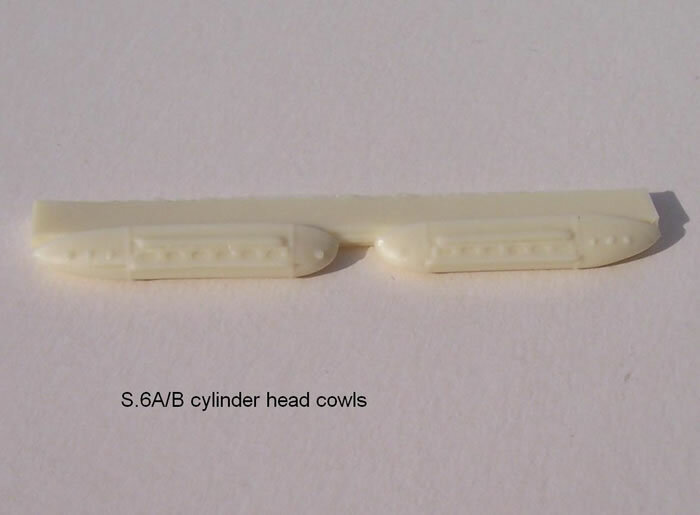 I’m assume these might have some role in venting coolant form the radiators, and I’m further assuming that they are present on the S.6 and not the S.6B kit because resin has enabled this detail to be captured (see captioned image). Can anyone shed some enlightenment on this point please? 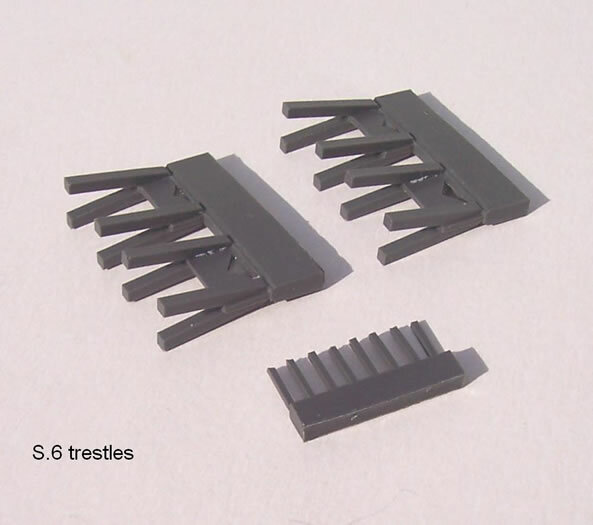 The kit float legs have a series of circumferential ridges on each leg, more on the front pair than on the back. 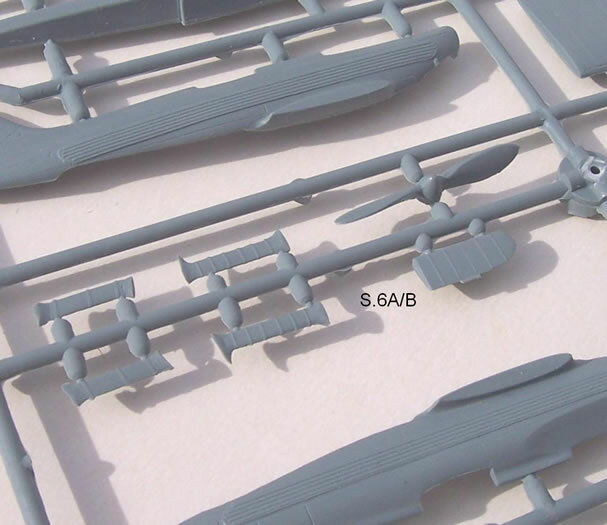 Photos and both Profile Publications’ and Pavla’s own artwork show the S.6 to have smooth float legs when compared to the ridged type of the S.6B. So perhaps Pavla have overlooked tooling smooth legs for the S.6. 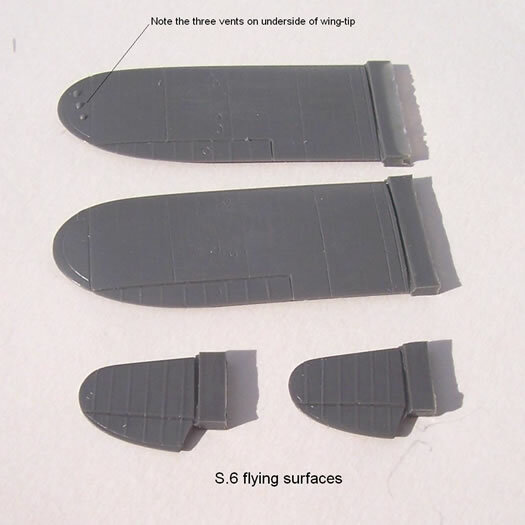 Therefore it will be necessary to carefully file and sand the ridges off the S.6’s resin legs for the correct appearance. Another difference, which is only evident in Profile Publications’ S.6 artwork, is that the S.6 is drawn with smoother cylinder-head cowls than those drawn for the S.6B. 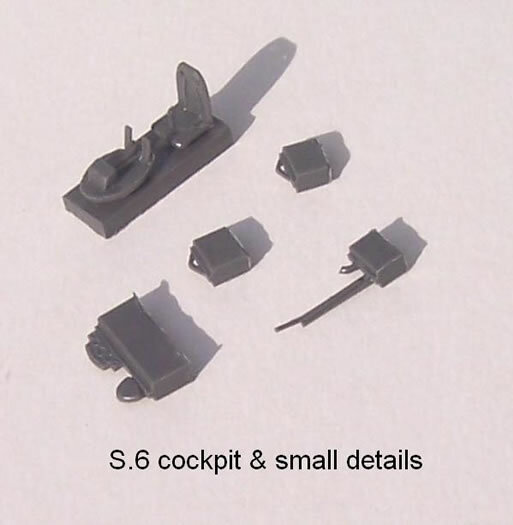 The S.6 drawing does not display the series of small punched vents that are quite evident on the S.6B artwork, with one leading and three following the exhaust ports. I noticed that Pavla used the same cylinder-head cowl pattern with vents for both kits, so I did some checking. In this case I think that Profile’s drawing may be wrong, and that Pavla’s is right, because photos from 1929 clearly show these vents on the S.6. 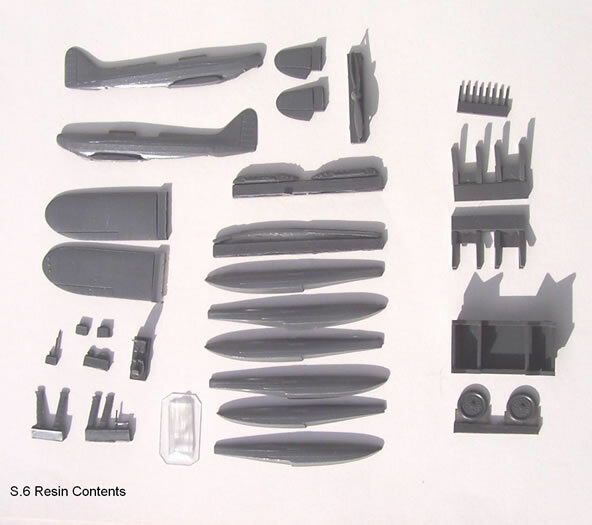 The kit breakdown is very much as would be expected, except that there is a thin longitudinal insert catering for the finned ventral oil-cooler surface as well as two conventional fuselage halves. A quite detailed cockpit interior is included, but the cockpit opening is almost too small to do it justice. The comparatively huge cylinder-head cowls mount on the slender fuselage, and these have nicely detailed exhaust ports plus the vents mentioned above. 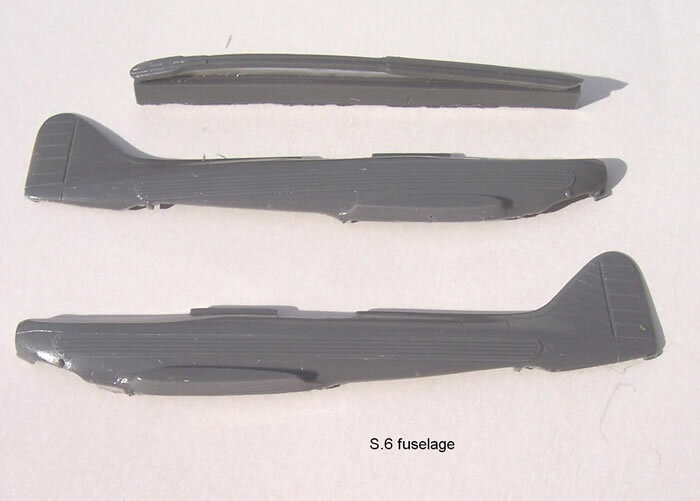 Wings and horizontal stabiliser are two parts each with fixed control surfaces. Detail is finely done as befits the smooth finish of the original. The real challenge with either kit will be in aligning the floats. Pavla sensibly indicates to add weight to the float fronts rather than the fuselage nose in order to avoid too much weight on the float legs. The kit includes a resin beaching trolley and trestles. I think that the beaching trolley, without wheels, would make a handy jig for the floats during construction. 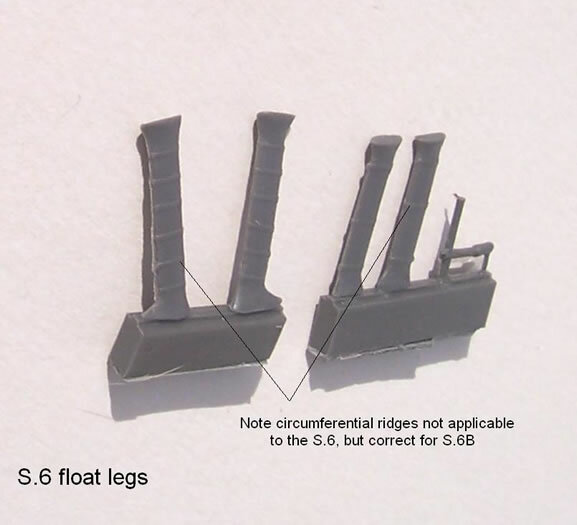 For the S.6 I would also suggest drilling out the locating points of the float legs and the legs accept thin wire pegs. This should aid parts location and enable small adjustments to be made before locking with super glue or letting epoxy cure. Some thought will need to be given to the float bracing wires, as these are substantial, and have a prominent streamlined fairing where they cross each other. The beaching trolley itself is a nice addition common to both kits that many will welcome. It features large spoked wheels that will need careful dry-brushing over dark background to appear convincing. There may be some PE-inserts from for larger scale like 1/48 that could be mounted in the hollowed out wheels for a more authentic look. Trestles to prevent the plane from tipping when parked on the trolley are also included. Personally I think the trolley’s greatest value is as a jig as I have already mentioned. There are not a lot of parts to either kit, especially if the beaching gear is excluded from the count. All that remains to mention are the control actuators and pitot. I was surprised to read that the pitot was only fitted for test flights, so presumably races were flown almost totally by seat of the pants. In fact I read that with the R engine it was its temperature at any given time that determined how more throttle was used, and therefore how fast the plane could fly. So marginal was the cooling and the threshold between racing glory and disaster. So small that I almost forgot to mention it is the canopy. This is a vac-form offering that should be easy to remove, as all cuts are straight. Two are provided. Markings for two S.6’s in three guises are provided. 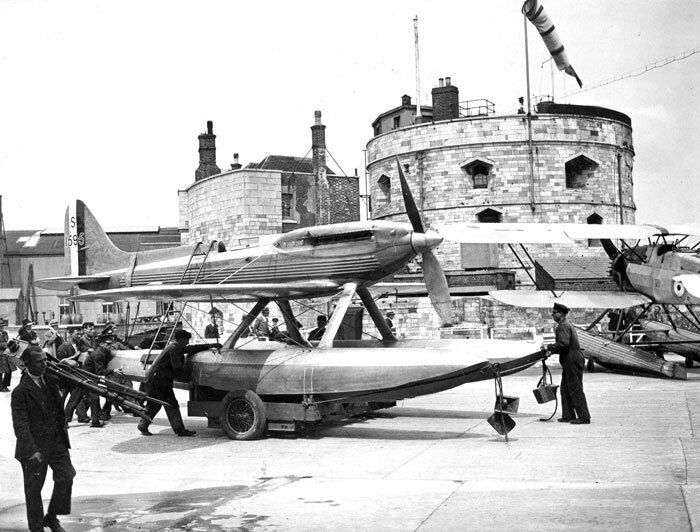 One is the 1929 Schneider Trophy race winner, and world speed record setter, N247. 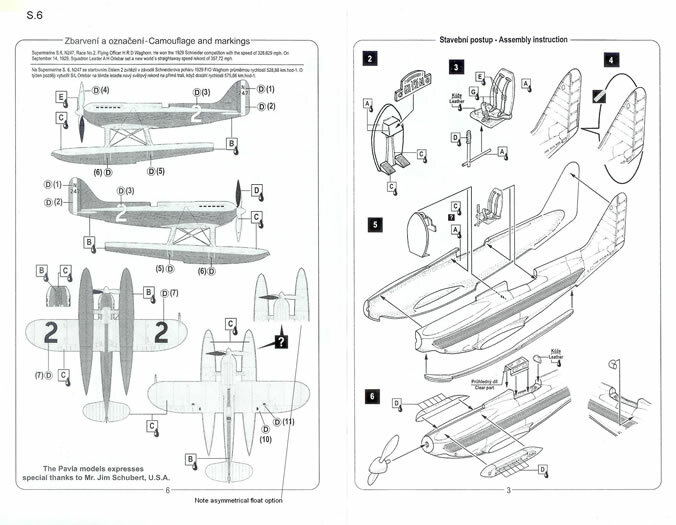 It is for this aircraft that the instructions indicate the asymmetrical float arrangement. Sadly Pavla does not tell us for which achievement the long starboard float is applicable. The other option is for the other S.6 competing in 1929, N248, which was disqualified for cutting inside a corner marker. The third option is for N247 wearing only rudder flash and serial number when being used for testing prior to the 1929 race. The S.6B/S.6A options cover the 1931 race winner S.1595, the 1931 world speed record setter S.1596, and S.6A N247 which was formerly the 1929 speed record holding S.6. This last aircraft was used for practice. Decals for all options appear to be well registered with good opacity. Price does not usually come into my reviews, but the price of the resin S.6 is 53% more than the multimedia S.6B. This is not surprising in so far as resin kits generally cost more to produce due to the materials used and labour intensiveness. 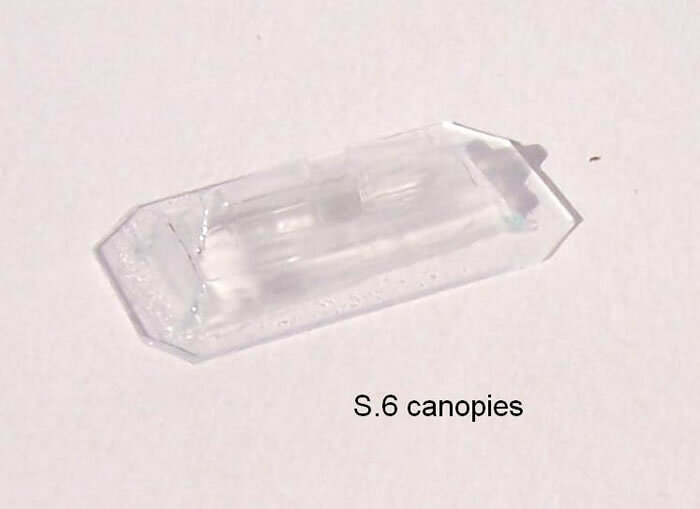 What is surprising is that Pavla did not simply use their styrene kit with some new resin floats and a different prop. Certainly this price difference combined with the S.6B’s greater fame may limit sales of the less famous but equally interesting S.6. Firstly, please forgive me if this review has been too much of a history lesson. I found researching this subject added new depth to what had been for me at least, more folklore than facts about the Supermarine Schneider story. I thought it worth sharing in case there are others like me in this regard. 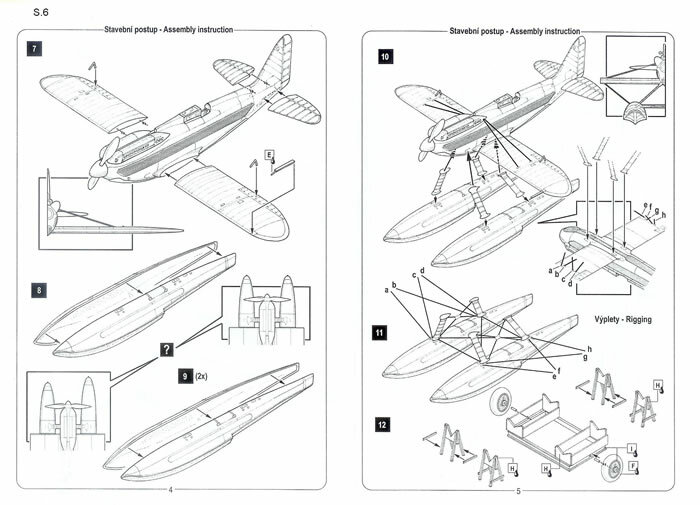 Just be grateful that I didn’t digress into discussing the Porco Rosso movie, its links to the Schneider Trophy, and the Fine Molds kits of the cartoon aircraft! For what it’s worth, I feel the S.6 is an equally deserving subject as the S.6B. Perhaps even more so, because it won its Schneider race convincingly against competition, as well as setting a world speed record. But no doubt the S.6B will forever overshadow both its S.6 and S.5 forebears. This is a pleasing production of the S.6. Pavla’s use of the S.6B masters makes good sense as basically all that was needed was a different propeller and new floats (bearing in mind the smooth leg issue). 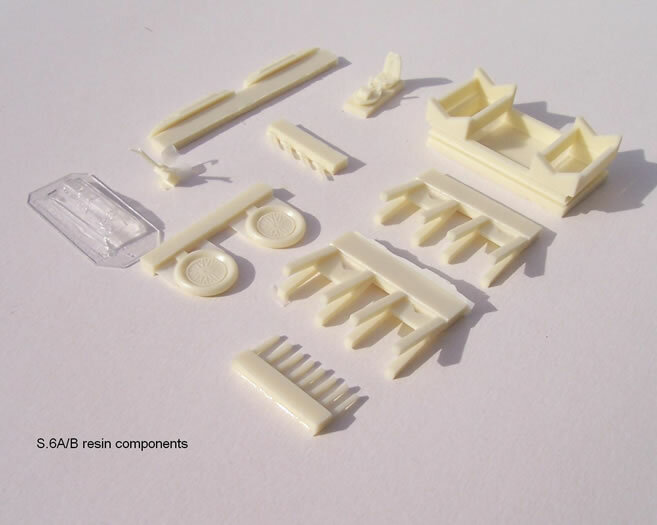 The use of resin over styrene for the parts shared with the S.6B kit is surprising from a pricing perspective. But in my view it is still worth it if you wish to avoid scratch-building floats to convert the S.6B back to the S.6. 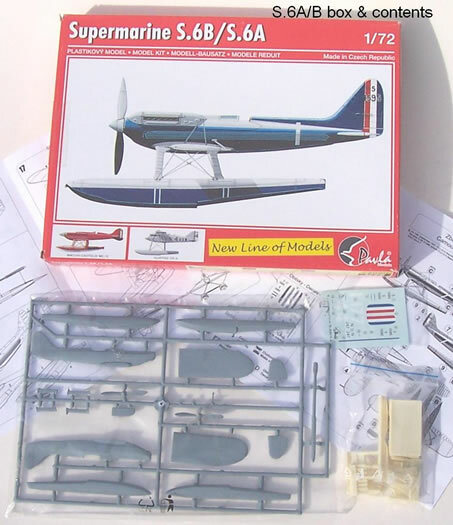 Subjects like the Schneider Trophy have a special appeal, and these kits have all the potential to build into a very nice models. I definitely recommend both to resin or limited run kit builders with some experience. Now come on Pavla, we need a S.5, and definitely the very pretty S.4 to round the S monoplane stable out. Not to mention the Curtis CR-3 and Macchi-Castoldi MC.72 you have printed on the bottom of the S.6B’s box art and have been tempting us with for a couple of years now! 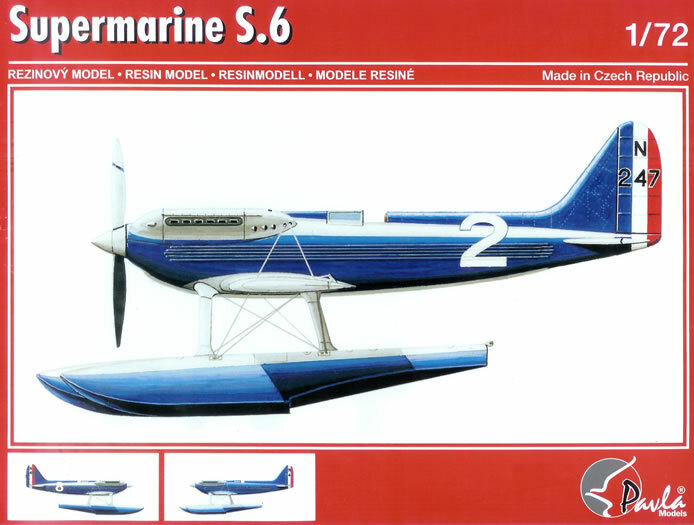 Thanks to Pavla Models for the Supermarine S.6 review sample.